Comments: Fender switched back to the blackface era cosmetics some time in 1980. 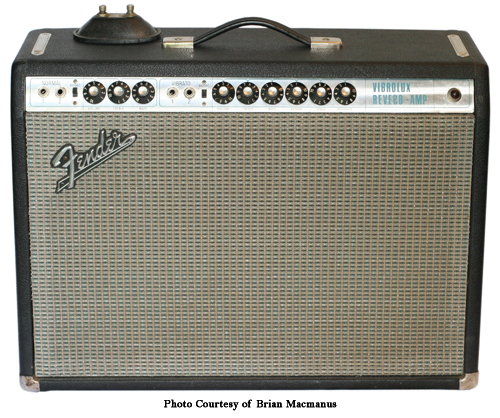 Vibrolux Reverbs produced between late 1980 and 1982 have a black control panel and silver sparkle grille cloth. A Boost pull switch was added some time in the mid 70s. What happened to the average eBay prices? anyone know where I can find instructions for biasing the tubes on this amp? I have a silver face Vibrolux Reverb and find a booster pedal hole on buck, but no wireing. So I want to make it. If somebody know the shematics of , please slem me know how to do it. sorry for duplicates, but theres no confirmation that thIs email was delivered. what kind of fuse is correct for it? what kind of tubes and capacitors do you recommend? Just bought a 1970 Vibrolux AA270 completely original as far as I can tell, bought it online for $800 because the price seemed good and I hardly ever see one of these when I actually have some money! The guy says it lights up when he turns it on but otherwise he has no guitar to test with. Imagine having no guitar at all. Anyway, pretty excited about the new amp – and I am used to taking them in for service right off the bat. I will report back when there is news. I couldn’t resist – fired it up and the Vibrolux sounds good! Not sure what I should be expecting though, especially in the areas of trem and reverb, so I will take it in for servicing. I also just read a cool online article in Premier Guitar about upgrading to a blackface circuit for the what the author referred to as a more “robust” gigging amp. I was originally looking for good ideas for new speakers, he recommended East speakers (think he runs the business) any ideas are very welcome – i love this amp. I bought a 1972 Vibrolux on ebay, coming tomorrow.Are you still liking yours? Did you keep original speakers? Send me that link please! I also picked up a 70′ Vibrolux that I love but would like to see what the mod would do.